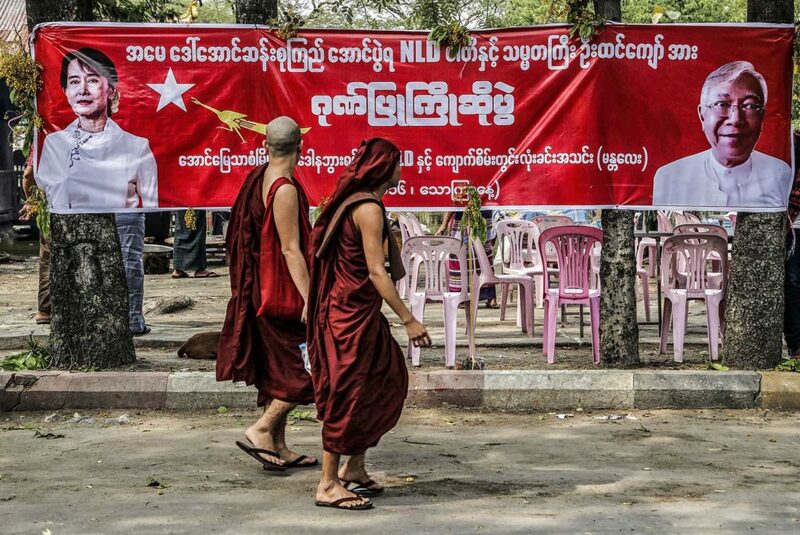 Monks pass by a banner to celebrate Myanmar's new President U Htin Kyaw in Mandalay on April 1, 2016. The Southeast Asian nation was dominated by the military for more than 50 years until March 30 when Aung San Suu Kyi and her pro-democracy party took power. On March 30th, U Htin Kyaw, Myanmar’s first civilian president in 53 years, took office—a major step in the country’s transition from military rule, economic sanctions and isolation from the global economy. During this transition, investor interest in the country has spiked as Myanmar is one of the world’s last economic frontiers with a significant population, valuable resources and an attractive location. The political and economic liberalization underway has unleashed rapid economic growth. The Asian Development Bank projects the country’s growth to be 8.4 percent for fiscal year 2016 (ending March 31, 2017), with the current year’s economic activity expected to increase by 8.3 percent, which would make Myanmar the fastest growing economy in Southeast Asia. Although investors from Asia, Europe, the Middle East, and more recently the U.S., have poured into the country, they face a daunting operating environment characterized by underdeveloped infrastructure, widespread poverty, questions about political stability and poor governance. While investor expectations are high for Myanmar, the big question over the next several years will be whether the new government can effectively modernize the country, satisfy the military and deliver upside to a politically mobilized population. Aung San Suu Kyi’s National League for Democracy (NLD) won a landslide victory in the 2015 November national elections, giving the reformers control of the parliament and the power to appoint the president. The constitution, written by the military, barred Suu Kyi, a Nobel Peace Prize laureate, from assuming the presidency because her children hold foreign citizenship. In response, she declared she is “above the presidency” and indicated she intends to rule from behind the throne having nominated Kyaw, her long-time friend and assistant. Suu Kyi will sit on the National Defense and Security Council, Myanmar’s highest advisory body and she has appointed herself head, at least initially, of the foreign affairs, energy, and education ministries and the president’s office. The constitution gives considerable power to the military and the military occupies a constitutionally-mandated 25 percent of seats in the parliament—a sufficient share to block major initiatives—so the NLD government will have to work in close partnership to rule effectively. Moreover, in the days running up to the transition of power, military leaders made clear they were not retreating to their barracks. Two-fifths of the country’s population is made up of ethnic and religious minorities, many of whom have been subject to extreme economic privation and human right abuses over many decades. Communal violence has periodically flared and could erupt if grievances are not addressed and tensions managed by the new government. The military could stir animosities if they so choose and military leaders have suggested they could take a more assertive role if tensions were seen as getting out of hand. All this leaves the NLD government with a very delicate balancing act to finesse. Big tasks now for Myanmar: modernize the country, satisfy both military and a politically mobilized population. According to United Nations Conference on Trade and Development, gross inbound foreign direct investment (FDI) in 2014 amounted to just less than $1 billion—a fraction of the amount that flowed to Myanmar’s neighbors in south and Southeast Asia. With the transition to democracy, FDI is expected to surge and government officials are struggling to keep pace with overwhelming interest from abroad. Investors also are seeking low labor costs—for apparel and other manufacturing—and to gain access to a largely untapped market of 54 million, albeit very poor, consumers. Gross national income per capita was a mere $1,270 in 2014. To date, one-third of FDI has gone into the oil and gas sector and the power sector has accounted for 23 percent of investment. (At the end of 2015, more than 70 percent of the population had limited or no access to electricity.) Many Japanese firms are keen to invest in Myanmar as labor costs rise in Thailand and a Japanese-Myanmar consortium recently opened a new special economic zone outside Yangon. Tourism is another potential moneymaker. Most of the country is rural and agriculture is the largest sector in terms of output and employment. Jade, often haphazardly mined, is one of the country’s top exports. Meanwhile, the country’s manufacturing sector—with almost 70,000 largely small enterprises—is far from world-class; in 2015 Myanmar was in the 98th percentile for manufacturing skills. To develop and modernize, Myanmar seeks to capitalize on its proximity to India and China and its membership in the ASEAN Economic Community. To rejoin the global economy, Myanmar has been playing catch-up with a slew of liberalization policies, including 30 new laws enacted since the lifting of sanctions in 2012. The telecom sector was liberalized in 2013 contributing to a jump in mobile penetration from 33 percent in 2014 to nearly 55 percent in 2015. The capital market is nascent and under-developed. The banking sector was liberalized in 2014, but only so far as to provide investment services to foreign entities. A Securities and Exchange Commission was established in August 2014, and the Yangon Stock Exchange launched in late March. In addition to the threat of the military reasserting power, Myanmar faces an array of daunting governance challenges that could easily undermine investors’ and citizens’ high hopes. Myanmar sits near the bottom of the charts on many governance indices. Myanmar was ranked in 167th of 189 countries in the World Bank Group’s latest Doing Business Index. Despite the many changes in the regulatory framework, Myanmar lags behind in key areas such as investment protection, land and labor issues, pace of dispute resolution, intellectual property rights. Reliable market data is hard to come by. Thanks to the indiscretions of the military, Myanmar was ranked 147th of 167 countries rated in the Transparency International Corruption Perceptions Index. The NLD government is working hard to change this perception, in part by adopting a more austere presence and by reducing the size of the bureaucracy. Myanmar is seeking to break out in a challenging environment. Global growth is slow, oil and gas processes are down, and trade is slowing and loosing its power to drive economic development. Meanwhile, Myanmar is competing with its neighbors—India, Bangladesh, Cambodia, and Vietnam—for many of the same investor dollars. 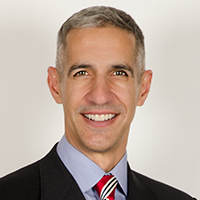 DJ Peterson is the founder and president of Longview Global Advisors—a research and consulting firm that focuses on political, social, and economic trends and helps business leaders and investors make sense of a complex world.